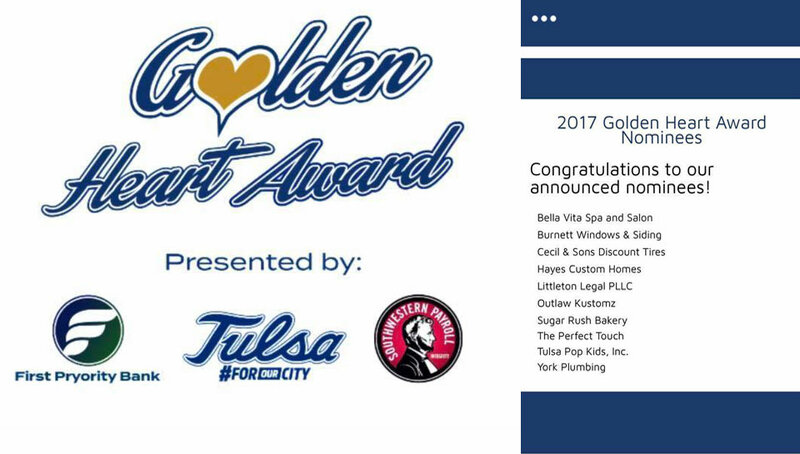 Hayes Custom Homes has qualified as one of the Top 10 finalist for the 2017 Tulsa Golden Heart Award!! It is our honor to be a finalist with 9 other amazing companies! We can’t say enough about what an amazing and professional process this has been and what amazing people we have met along the way! We will find out the winner on Sept 9th right before our Tulsa Golden Hurricane open up against LA-Lafayette! We would like to thank all our Tulsa area friends who nominated us and thank the great local businesses for their giving of resources and time to organization and present this great award! https://hayescustomhomesok.com/wp-content/uploads/2017/06/Logo.jpg 0 0 hayescustomhomes https://hayescustomhomesok.com/wp-content/uploads/2017/06/Logo.jpg hayescustomhomes2017-06-20 13:24:262017-08-31 00:04:33Hayes Custom Homes has qualified as one of the Top 10 finalist for the 2017 Tulsa Golden Heart Award!! View more project photos and read reviews when you visit us at Houzz. View videos we have when you visit our YouTube channel.